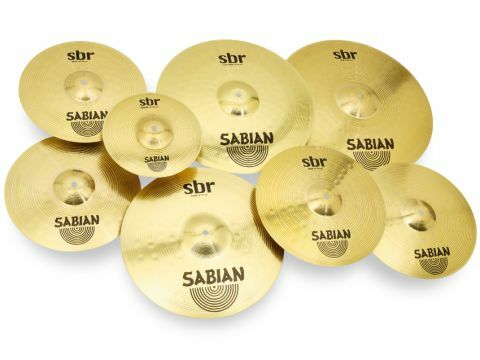 The SBrs are a great improvement on the Solars, borne out by the fact Sabian is happy for them to sport its logo. Brass cymbals will never sound as complex as proper bronze cymbals, but these are well worth upgrading to from the cymbals thrown in with your starter kit. Professional hammering and lathing. Up there with Paiste's 101s, maybe even the slightly more expensive PST3s. Ideal for beginners playing rock/ pop/r'n'b - and even for those attempting school jazz bands. Slightly lacking in character and edge. Newcomers to drumming can be caught unawares when they budget for their first kit, not realising that drum manufacturers don't make cymbals and that the cheap brass cymbals thrown in with their starter kit are hideous duffers. A first kit can sound as good as an expensive one, but cheap cymbals just sound nasty. Sabian started to address this problem with its Solar brass range and has now taken a further big step with the improved SBrs. The SBr range covers the popular sizes a beginner is most likely to need. Andy Gillespie of British distributors Westside points out that most sales in the brass cymbal market are boxed sets, which means the SBr Performance set (14" hats, 16" crash and 20" ride) will be the big seller at around 30 percent more expensive than the equivalent Solar box set. The add-on 10" splash and the two pairs of hats (13" and 14") are actually slightly cheaper than the equivalent outgoing Solars. The SBrs are produced from a "special formula brass alloy" at the Sabian plant in Canada. Colour-wise, brass cymbals are easy to spot, being a much brighter, golden-yellow hue than bronze, with a finish described by Sabian as Natural. The medium weight and classic profile, along with the Sabian logo, give the cymbals authenticity. And they look the part with their deep, large-peen hammering and pinpoint lathing. This is the same hand-guided, high-pressure hammering and hand lathing that Sabian lavishes on its expensive bronze cymbals. Since nearly all the cymbals that come a reviewer's way are bronze, tackling a brass set usually means two things: you know at least that you're in for something different. And it's usually going to be painful. So steeling ourselves for the expected tinnitus-worsening clang of the 20" ride we got a pleasant surprise. Yes, it is high-pitched and quite tinny, but it's a whole heap classier than the average starter brass platter. Beneath that initial thin attack there is some real meat and tone. The decay is pretty fast so you can crash-ride it and the bell has a reasonably powerful sound - in fact you could almost mistake it for a bronze bell. That extra quality is surely the result of the proper hammering and lathing and is equally evident when it comes to the crashes. Sabian has cleverly extracted the maximum sustain from what is normally unresponsive brass. Even expensive bronze 16"s sometimes offer little in the way of projection and we were expecting the 16" to suffer, being the smaller crash. But rather than returning a feeble, brittle 'ching', it yielded a proper crash-like whoosh with a modestly rich timbre. The decay is still fairly rapid, what you'd call a fast crash, but it actually sustained better than the 18", which is a designated crash-ride. The latter description is apt since the wash is brief and clears the path for your continuous ride patterns. As with the 20" ride, the 18" stick response, while clean, has that peculiar ability of brass cymbals to be both high-pitched and yet rather soft. And that mellow quality transfers to the bell which was less lively than on the 20", a little too spongy to cut through convincingly. There are two sets of hats. We tried the standard 14"s first. Partially opening them and attacking with the shoulder of the stick was encouragingly effective - hissy and thick and not at all frail or tinny. Likewise, playing opened-closed jazz rhythm sounded authentic and breezy. These were the closest to proper bronze cymbals of the whole collection. The closed sound is where the cymbals are a little lacking in character and edge. In fact everything about the hats works fine except the pedalled 'chick'. However much we angled the bottom cymbal, when we stomped our feet down we got a relatively feeble 'chip'. Swapping for the 13"s, the pitch rises significantly, placing the tone on the edge of slightly unpleasant and thinly strident. Underneath, though, there is still that quite substantial body and the closed, steady eighths stick sound is dense, if soft. The half-opened, shouldered sound is also higher pitched and strident, but is off-set by the underlying body once again. Rounding out the set there is a 10" splash, always a popular addition. There's not much you can do with a brass cymbal this small to avoid the dinner gong tone, but once again Sabian has done well to extract an initial fast and exciting 'tiss'.